October 30, 2014 is no longer the cut off date—well, at least for now. Microsoft updated its Windows lifecycle table last week, quietly announcing that OEMs would have to cease preinstalling Windows 7 on new systems by October 30, 2014. Retail boxed copies of the operating system have already ceased, ending on October 30 of this year. This of course leaves open the possibility that the October 30, 2014 date could be the cut-off. As things stand, Windows 7 is still due to leave mainstream support on January 13, 2015, giving Windows 7 systems just a few months of full support. Extended support—which for the most part means “security fixes”—is due to run until January 14, 2020. More pressing is the end of Windows XP’s extended support, which is still due to terminate on April 8, 2014. Microsoft may revert to separate release schedules for consumer and business versions of Windows, the company’s top operating system executive hinted this week. At a technology symposium hosted by financial services giant Credit Suisse, Tony Myerson acknowledged the operating system adoption chasm between consumers and more conservative corporations. Myerson, who formerly led the Windows Phone team, was promoted in July to head all client-based OS development, including that for smartphones, tablets, PCs and the Xbox game console. Myerson’s comment hinted at a return to a practice last used in the early years of this century, when Microsoft delivered new operating systems to the company’s consumer and commercial customers on different schedules. Before 2001’s arrival of Windows XP — when Microsoft shipped consumer and business versions simultaneously — Microsoft aimed different products, with different names, at each category. In 2000, for example, Microsoft delivered Windows ME, for “Millennium Edition,” to consumers and Windows 2000 to businesses. Prior to that, Windows 95, although widely used in businesses, was the consumer-oriented edition, while Windows NT 4.0, which launched in 1996, targeted business PCs and servers. The update/upgrade-acceptance gap between consumers and businesses reappeared after Microsoft last year said it would accelerate its development and release schedule for Windows, then delivered on the first example of that tempo, Windows 8.1, just a year after the launch of its predecessor. Enterprises have become nervous about the cadence, say analysts. Businesses as a rule are much more conservative about upgrading their machines’ operating systems than are consumers: The former must spend thousands, even millions, to migrate from one version to another, and must test the compatibility of in-house and mission-critical applications, then rewrite them if they don’t work. That conservative approach to upgrades was a major reason why Windows XP retained a stranglehold on business PCs for more than a decade, and why Windows 7, not Windows 8 or 8.1, has replaced it. In October, outgoing CEO Steve Ballmer dismissed concerns over the faster pace. At a Gartner Research-sponsored conference, when analyst David Cearley noted, “Enterprises are concerned about that accelerated delivery cycle,” Ballmer simply shook his head. Myerson’s hint of separate release trains, to use Silver’s terminology, may be a repudiation of Ballmer’s contention. Or not. His statement of, “It may be the right way to continue serving the enterprise market,” could be interpreted to mean that Microsoft will maintain an accelerated tempo for business versions of Windows — one faster than the three years between upgrades that the company has used in the past — and speed up Windows updates to consumers even more. “The consumer really is ready for things to be upgraded on their own,” Myerson said. And one crack might be, according to Myerson, a separation of consumer and commercial on Windows. Microsoft has quietly ended retail sales of Windows 7, according to a notice on its website. The company’s policies for shutting off sales to retailers and shipping licenses to OEMs (original equipment manufacturers) are posted on its site, which was recently updated to show that Windows 7’s “retail end of sales” date was Oct. 30. The next deadline, marked as “End of sales for PCs with Windows preinstalled,” will be Oct. 30, 2014, less than a year away. Microsoft’s practice, first defined in 2010, is to stop selling an older operating system in retail one year after the launch of its successor, and halt delivery of the previous Windows edition to OEMs two years after a new version launches. The company shipped Windows 8, Windows 7’s replacement, in October 2012. As recently as late September, the last time Computerworld cited the online resource, Microsoft had not filled in the deadlines for Windows 7. At the time, Computerworld said that the end-of-October dates were the most likely. A check of Microsoft’s own online store showed that the company has pulled Windows 7 from those virtual shelves. In practical terms, the end-of-retail-sales date has been an artificial and largely meaningless deadline, as online retailers have continued to sell packaged copies, sometimes for years, by restocking through distributors which squirreled away older editions. Today, for example, Amazon.com had a plentiful supply of various versions of Windows 7 available to ship, as did technology specialist Newegg.com. The former also listed copies of Windows Vista and even Windows XP for sale through partners. Microsoft also makes a special exception for retail sales, telling customers that between the first and second end-of-sale deadlines they can purchase Windows 7 from computer makers. “When the retail software product reaches its end of sales date, it can still be purchased through OEMs (the company that made your PC) until it reaches the end of sales date for PCs with Windows preinstalled,” the company’s website stated. The firmer deadline is the second, the one for offering licenses to OEMs. According to Microsoft, it “will continue to allow OEMs to sell PCs preinstalled with the previous version for up to two years after the launch date of the new version” (emphasis added). After that date, Microsoft shuts off the spigot, more or less, although OEMs, especially smaller “white box” builders, can and often do stockpile licenses prior to the cut-off. But officially, the major PC vendors — like Dell, Hewlett-Packard and Lenovo — will discontinue most Windows 7 PC sales in October 2014, making Windows 8 and its follow-ups, including Windows 8.1, the default. Even then, however, there are ways to circumvent the shut-down. Windows 8 Pro, the more expensive of the two public editions, includes “downgrade” rights that allow PC owners to legally install an older OS. OEMs and system builders can also use downgrade rights to sell a Windows 8- or Windows 8.1-licensed system, but factory-downgrade it to Windows 7 Professional before it ships. Enterprises with volume license agreements are not at risk of losing access to Windows 7, as they are granted downgrade rights as part of those agreements. In other words, while Microsoft may try to stymie Windows 7 sales, the 2009 operating system will long remain a standard. As of the end of November, approximately 46.6% of all personal computers ran Windows 7, according to Web measurement vendor Net Applications, a number that represented 51.3% of all the systems running Windows. Aruba Networks today announced a new Aruba Central cloud-based management service for Wi-Fi networks that could be valuable to companies with branch operations, schools and mid-sized networks where IT support is scarce. Aruba still sells Wi-Fi access points but now is offering Aruba Central cloud management of local Wi-Fi zones, for which it charges $140 per AP annually. The company also announced the new Aruba Instant 155 AP, a desktop model starting at $895 and available now and the Instant 225 AP for $1.295, available sometime later this month. A new 3.3 version of the Instant OS is also available, and a new S1500 mobility access switch with 12 to 48 ports starting at $1,495 will ship in late 2013. Cloud-based management of Wi-Fi is in its early stages and today constitutes about 5% of a $4 billion annual Wi-Fi market, Aruba said, citing findings by Dell’Oro Group. Aruba said it faces competition from Aerohive and Meraki, which Cisco purchased for $1.2 billion last November. Cloud-based management of APs is ideally suited for centralizing management of branch offices or schools that don’t have their own IT staff. Aruba relies on multiple cloud providers and multiple data centers to support Aruba Central, Hooks said. The two new APs provide 450 Mbps throughput in 802.11n for the 155 AP and 1.3 Gbps for the 220 AP, Aruba said. Each AP in a Wi-Fi cluster running the Instant OS can assume controller functions with intelligence built in. The first AP installed in a cluster can select itself as the master controller of the other APs and if it somehow fails, the next most senior AP selects itself as the master. Microsoft wants its Windows XP users to get with the program, and is giving them 365 days to do so. One year from today, Microsoft will shut down extended support for its 12-year-old operating system, in favor of newer platforms like Windows 7 and 8. In 2002, Microsoft launched its Support Lifecycle policy, allowing 10 years of combined mainstream and extended support for Microsoft Business and Developer products, including Windows OSes. To that end, Windows XP SP3 and Office 2003 will lose that support on April 8, 2014. “If your organization has not started the migration to a modern desktop, you are late,” Stephen Rose, senior product manager for Windows Commercial, wrote in a blog post. He revealed that it takes an average company 18 to 32 months to reach full deployment, and urged businesses to begin planning and application testing “immediately,” to avoid issues later. But don’t think that a simple upgrade from XP to Windows 7 or 8 — a “modern operating system,” according to Rose — will do the trick. “You will need to do a clean install,” Rose said, meaning user data must be migrated and applications reinstalled on the new OS. More details on testing hardware and apps can be found on the Windows blog. Microsoft already pulled mainstream support for Windows XP in April 2009, but come this time next year, it will drop extended support, meaning no more security updates, non-security hotfixes, free or paid assisted support options, or online technical content updates. Rose warned that running XP SP3 and Office 2003 after support ends can expose companies to potential security risks. Even anti-virus software support won’t be enough, and vulnerabilities discovered in the operating system or applications running on it will remain unpatched and open to malware. “Using XP after April 2014 is an ‘at your own risk’ situation for any customers choosing not to migrate,” Rose wrote. Windows XP launched in 2001, and has been named Microsoft’s most popular OS of its time. Redmond has given users plenty of time to make the move; the software giant announced the news last April, two years before the shutdown, before the Windows 8 launch. According to March data from Net Applications, approximately 38.73 percent of PC users are still using Windows XP; the most popular OS is Windows 7 with 44.73 percent. About 4.99 percent are on Vista, while only 3.17 percent have upgraded to Microsoft’s latest, Windows 8. Security vendors analyzing the code used in the cyber attacks against South Korea are finding nasty components designed to wreck infected computers. Tucked inside a piece of Windows malware used in the attacks is a component that erases Linux machines, an analysis from Symantec has found. The malware, which it called Jokra, is unusual, Symantec said. “We do not normally see components that work on multiple operating systems, so it is interesting to discover that the attackers included a component to wipe Linux machines inside a Windows threat,” the company said on its blog. Jokra also checks computers running Windows XP and 7 for a program called mRemote, which is a remote access tool that can used to manage devices on different platforms, Symantec said. South Korea is investigating the Wednesday attacks that disrupted at least three television stations and four banks. Government officials reportedly cautioned against blaming North Korea. McAfee also published an analysis of the attack code, which wrote over a computer’s master boot record, which is the first sector of the computer’s hard drive that the computer checks before the operating system is booted. A computer’s MBR is overwritten with either one of two similar strings: “PRINCPES” or “PR!NCPES.” The damage can be permanent, McAfee wrote. If the MBR is corrupted, the computer won’t start. The malware also attempts to shut down two South Korean antivirus products made by the companies Ahnlab and Hauri. Another component, a BASH shell script, attempts to erase partitions Unix systems, including Linux and HP-UX. Security vendor Avast wrote on its blog that the attacks against South Korean banks originated from the website of the Korean Software Property Right Council. The site had been hacked to serve up an iframe that delivered an attack hosted on another website, Avast said. The actual attack code exploits a vulnerability in Internet Explorer dating from July 2012, which has been patched by Microsoft. Starting this week, Microsoft will begin giving Windows 7 users who have yet to install Service Pack 1 a helpful push into the safer, more secure future. SP1 will start rolling out as an automatic update, and that’s a very good thing. Not only does Windows 7 Service Pack patch numerous flaws in the uber-popular OS, but it also bring loads of performance and stability tweaks. It’s also going to be a support requirement going forward come April 9, 2013. Microsoft wants to make sure everyone who’s using Windows 7 is running the version that’s in line for all the upcoming bug fixes. Critical security fixes, of course, will still be delivered to all Windows 7 users, not just those who welcome SP1 with open arms. There’s really no reason not to install the update, unless you’re a network administrator with very particular platform requirements for your in-house apps… or you happen to be running a copy of Windows that might not be 100% legal. Don’t be expecting to see any dramatic changes after you install, though. Microsoft’s official notes about what’s included in Windows 7 SP1 are thin on details and the few changes that do get mentioned aren’t very exciting. Better print output from the XPS viewer won’t make you want to raise your glass, but improved audio reliability over HDMI connections might at least be worth a golf clap if you’re going to be running SP1 on a media center computer. To make sure you’re ready to receive Microsoft’s SP1 push, just pop in to the Control Panel and click the Windows Update icon. If you’re feeling a bit geekier, hit services.msc from the search box and verify that the Windows Update service is running. iOS 6.1 hammering Exchange, dragging down server performance. iOS 6.1 devices are hammering Exchange servers with excessive traffic, causing performance slowdowns that led Microsoft to suggest a drastic fix for the most severe cases: throttle traffic from iOS 6.1 users or block them completely. “When a user syncs a mailbox by using an iOS 6.1-based device, Microsoft Exchange Server 2010 Client Access server (CAS) and Mailbox (MBX) server resources are consumed, log growth becomes excessive, memory and CPU use may increase significantly, and server performance is affected,” Microsoft wrote on Tuesday in a support document. The problem also affects Exchange Online in Microsoft’s Office 365 cloud service. Office 365 customers may get an error message on iOS 6.1 devices stating “Cannot Get Mail: The connection to the server failed.” The Microsoft support article says both Apple and Microsoft are investigating the problem. Microsoft suggests several fixes, starting out gently, then escalating to the complete blockage of iOS 6.1 devices. Based on the fixes suggested, the problems may be caused when iOS devices connect to Exchange calendars. One Exchange administrator who created a throttling policy through PowerShell to solve the problem provides a guide here, but Microsoft also has a page providing instructions. We don’t know exactly how widespread this problem is. It’s clearly not affecting everyone, but the impact seems to run the gamut from small businesses to large. A support thread on Microsoft’s Exchange Server site was opened January 31 to discuss the excessive logging caused by iOS 6.1. The server administrator who began the thread identified an iPad that “caused over 50GB worth of logs” on a single database. iOS 6.1 was released on January 28. iOS 6.1.1 came out a couple of days ago, but for now it can only be installed on the iPhone 4S and is designed to fix cellular performance and reliability. Apple didn’t mention anything about Exchange fixes when releasing this latest version. Last year, iOS 6.0.1 fixed an Exchange problem that could lead to entire meetings being canceled when even a single iOS user declined a meeting invitation. The iOS 6.1 problem isn’t the first time iOS has caused Exchange servers to perform poorly. An Apple support article from 2010 describes sync problems in iOS 4 and says, “Exchange Server administrators may notice their servers running slowly.” At the time, Microsoft noted iOS 4 led to “Exchange administrators… seeing heavier than normal loads on their servers from users with iOS devices.” Microsoft got in touch with Apple to fix that problem. We’ve asked both Apple and Microsoft how many users are impacted by the latest problem, and when a more permanent fix is coming. We also asked Apple if it agrees with the workarounds suggested by Microsoft. Microsoft told us it has nothing else to say, as the “support article contains the latest.” Apple has not responded to our request for comment as of yet. Apple’s suggested fix is to turn the Exchange calendar off and back on again within the iPhone’s settings. An operating system update to fix the problem is on the way. “Apple has identified a fix and will make it available in an upcoming software update,” Apple said. A serious flaw in the operating system running Juniper routers can make them crash and reboot, the network equipment vendor has advised. By sending a specially crafted transmission control protocol (TCP) packet to a listening port on a Juniper Routing Engine, it’s possible to make the kernel in JunOS crash, and cause them to swich over or reboot. The chief technical officer at New Zealand ISP and Juniper Elite partner Snap Internet, Sam Brock-Smith labelled the flaw “nasty”. “It has the potential to crash or lock up core Juniper routers,” Brock-Smith said. Snap Internet uses Juniper switches and routers extensively on its national network and at overseas locations, Brock-Smith said, adding that the provider’s engineering team is working with the Juniper Technical Assistance Centre (JTAC) to ensure it is protected against the vulnerability. While specific details of what triggers the flaw weren’t given, versions of JunOS older than January 17 are affected, Juniper said, with newer ones containing a fix for the problem. A Juniper spokesperson confirmed the vulnerability to iTnews. “During routine internal product testing, Juniper discovered a potential TCP vulnerability that affects certain releases of JunOS software,” the spokesperson said. “The Juniper Networks Security Incident Response Team (SIRT) is not aware of any malicious exploitation of this vulnerability. Apart from getting a fixed version of JunOS, Juniper suggests in an advisory using access lists or firewall filters for the routers, deployed on both the edge and control plane, and source address anti-spoofing to prevent traffic from bogus addresses reaching the devices. Unicast reverse path forwarding — which checks if the IP address in a packet is reachable and if not, drops it — can also be utilised to mitigate against the attack, together with RFC 3682 time-to-live security. Juniper had approximately 20 percent of the router and switch market in 2012, according to a Bloomberg report. Maybe you’ve seen the ads on the Internet or on TV in the wee hours of the morning. They make lofty promises: get rid of blue screens and error messages! Increase your speed! Clean up your system! But even when these PC cleanup apps aren’t just malware in disguise, the things they’re doing for your PC are often dubious. Many either replicate tasks that can be handled by built-in utilities or do things that could cause more problems than they solve. These ads for PC cleanup products often follow the same basic formula: appeal to people with slow or buggy PCs, throw in a few shots of an operating system that looks kind of like Windows, tack on some “customer testimonials,” and offer a free diagnosis that will make all the problems go away. Once they’ve offered an easy solution and encouraged you to download and install the software, their next play is to make it seem like everything is wrong with your PC. Installing the free MyCleanPC scanner and running it using the default settings resulted in 1,020 “issues” on a PC with a week-old, barely-used clean install of Windows 8 running on it. It turns out the threshold for what constitutes an “issue” is absurdly low. Each and every cookie and cache stored within Google Chrome—files that are completely normal and are in no way inherently problematic—are all counted as individual issues. Every individual fragmented file on your drive? Also an issue. Individual registry errors? Issues. Prepare for liberal use of scary red Xs and big warning labels hoping to further incite user panic. The program is only too happy to identify all of these “issues” for you, but actually fixing them requires you to cough up $39.99 for a one-year license. These are business practices purpose-built to draw in especially worried or too-trusting users, with the ultimate goal of terrifying them about the run-down state of their PC before extracting money from their wallets. Many, many PC cleaning programs are designed to make your computer look more broken than it is, and to extract money from users who do not understand that. To many of you, I’m sure that’s a given. Luckily, the things these PC cleanup applications do (or say they do) are things that can be done just as easily with free tools, some of which are actually built into Windows itself. If your PC is actually tossing up error messages and crashing all the time, the chances are good your needs go further than what some sham of a cleanup app can fix for you. So what’s the right way to handle a slow PC, or one that’s acting strangely? It goes without saying you should do a full scan of your hard drive with whatever anti-virus product you’re using (I think Microsoft’s solution, which is built-in to Windows 8 and freely downloadable for Windows 7, is fine, but your tastes may differ), but if your computer is already infected it might need a little extra help. 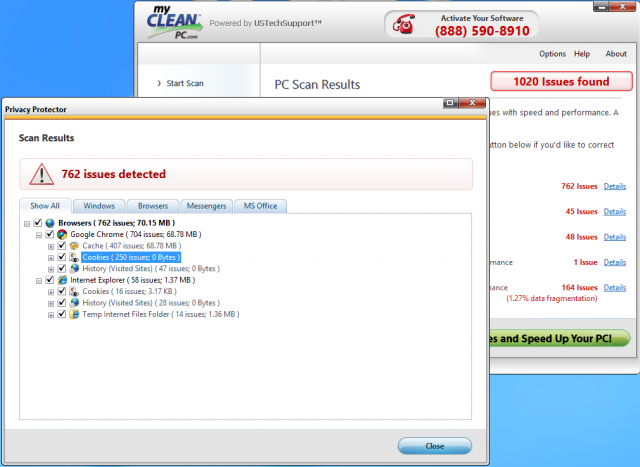 I’ve had excellent luck over the years with Malwarebytes Anti-Malware, a free security scanning product that does a decent job of cleaning infections that more conventional software can’t quite scrub away. Think of it as getting a second opinion about your computer’s health. Getting blue or black screens of death? Seeing particular error message pop-ups? There’s no shame in turning to a search engine for help. Just a couple of months ago I cleaned a particularly stubborn infection from a family member’s computer after Googling an error message I kept seeing. Neither Malwarebytes nor Microsoft Security Essentials could get rid of the infection entirely, but it was a common enough infection that another anti-virus vendor had issued a handy tool to destroy the malware. If your PC is coming up clean but just seems slow, it might be time to try removing some apps. Installing an applications or plugin that you actually want can also sometimes install applications and plugins that you never asked for, and these superfluous system tray icons and browser toolbars have a way of adding up over time. I hesitate to recommend that you uninstall things indiscriminately just because you don’t know what they are… but you should consider it (and when in doubt, use the previous trick). You should also run Windows’ built-in Disk Cleanup tool to get rid of old temporary files. Defragmentation can also help if you have a spinning hard drive but since Windows Vista, disk defragmentation is set to happen in the background on a schedule by default so it isn’t really the go-to recommendation it once was. If you’ve tried all of the above and your PC is still acting strangely, it’s time to start looking beyond software problems—it might be that you’ve got a bad stick of RAM or a failing hard drive that’s causing all of your trouble. Luckily for you, we’ve got a handy guide to help you diagnose most common hardware problems. If your hardware is fine, your other PC cleanup efforts have failed, and your computer is still acting strangely, it’s time to resort to scorched-earth tactics. Reinstalling Windows is a gigantic pain, granted, but it’s also the best way to guarantee a clean system, especially if you’ve been afflicted by some kind of rootkit. We’ve got a pair of guides—one for Windows 7 and one for Windows 8—that will take you all the way through the reinstallation process if you have to do it from scratch. Chances are your PC also came with some kind of recovery media or restore partition that you can use in a pinch. In either case you’ll still need to take care of your own data, which you’ll want to move to an external drive before wiping your operating system. You’ll also want to be very careful when restoring this backed-up data to your fresh Windows installation—scan everything on the external drive with your anti-virus software of choice and Malwarebytes before moving it back to guard against re-infection. Computerworld also points out that this vulnerability is similar in timing to a vulnerability that occurred December 28 last year, which Ars reported as having compromised a long list of technologies, including Microsoft’s ASP.NET. Microsoft then published a workaround for ASP.NET website admins in the wake of the discovery of the exploit. Waiting for a second Windows 7 Service Pack? Keep waiting – it doesn’t sound like Microsoft will be releasing one. Sources close to Microsoft’s sustained engineering team, which builds and releases service packs, have told The Register there are no plans for a second Windows 7 SP – breaking precedent on the normal cycle of updating Windows. Instead, Microsoft will keep updating Windows 7 using patches released each month until support for Windows 7 comes to an end. That date is currently slated for 24 months after the most current SP – that’s SP1, which was released in February 2011 – and would put end of life at January 2020. The decision not to release a second service pack for Windows 7 comes just at the time when Microsoft would typically be preparing to release the pack. People have been asking about SP2 since August. SP2 for Windows XP rolled out nearly three years after the operating system’s release while the Windows Vista SP2 came just over two years later. With the Windows 7 OS having been released in October 2009, we are now at the trailing edge of the standard release window for SP2. SPs are released to bundle up things like monthly updates and can include security and performance updates and support for new hardware. They span monthly updates released through Patch Tuesday; will wrap in fixes to apps like Office; and will impact software affecting the desktop, network and applications like the browser. A single SP means you can wrap up, test and rollout, and update – all in a single software release. Without a SP you must manually keep up to date on monthly releases. But IT solutions firm BDNA’s chief technology officer Walker White has a different opinion, and said organisations he has spoken to are satisfied with Windows 7 and felt the Windows 7 SP1 in February solved many problems. Certainly, the Windows 7 SP1 didn’t go smoothly for Microsoft – in spite of the theory that SPs allows Redmond to wrap up months of releases into a single, digestible bundle. SP1 saw users take to the forums to complain that the service pack was causing machines to boot with fatal errors, was deleting restore points before installing and had unleashed a reboot looping glitch. Microsoft said it was unable to pinpoint the cause of the problem. Google’s Android operating system will be used on more computing devices than Microsoft’s Windows within four years, data from research firm Gartner showed on Wednesday, underlining the massive shift in the technology sector. At the end of 2016, there will be 2.3 billion computers, tablets and smartphones using Android software, compared with 2.28 billion Windows devices, Gartner data showed. That compares to an expected 1.5 billion Windows devices by the end of this year, against 608 million using Android. Android, which reached the market only in 2008, has risen fast to be the dominant smartphone platform, controlling two-thirds of that market. It has taken the No. 2 spot in the fast-growing tablet computer market. The proliferation of the free software gives Google its edge on the search market – its key profit generator. Worldwide shipments of personal computers fell by over 8 percent in the third quarter, the steepest decline since 2001, as more consumers flock to increasingly powerful tablets and smartphones for more basic computing. Microsoft’s Windows has dominated the personal computer industry for decades, but the company has struggled to keep up with shift to wireless, and in smartphones its market share is around 3 percent. Still running XP or Vista and eyeing Office 2013? Sorry, you’re out of luck. Unveiled on Monday, the upcoming new Office suite won’t support Windows XP or Vista, meaning users who need or want Office 2013 will have to upgrade to Windows 7 or Windows 8. Microsoft confirmed the tighter requirements on its Office 2013 Preview Technet page. Only Windows 7, Windows 8, Windows Server 2008 R2, and Windows Server 2012 will be able to run the new suite. Users will also need a PC with at least a 1Ghz processor, 1GB of RAM for the 32-bit version (2GB for the 64-bit version), at least 3GB of free hard disk space, and a graphics card that can provide at least a 1024 x 576 resolution. The PC specs shouldn’t be a challenge for most users. But the OS requirement may prove problematic. Vista users have been dropping like flies, most of them likely upgrading to Windows 7 by this point. Recent stats from Net Applications showed Vista’s market share at less than 7 percent in June, and steadily dropping. But Windows XP is hanging on after more than 10 years. Though Windows 7 is likely to claim the top spot this month, XP still holds more than 40 percent of the market, according to Net Applications. That figure certainly covers many businesses, large and small, that rely on XP as a standard and stable environment that supports all their applications and is familiar to their users. Microsoft may be hoping that the appeal of Office 2013 will prompt more users and businesses to move away from XP. The company may even been looking at the combination of Windows 8 and Office 2013 to convince more people to upgrade both their OS and Office suite around the same time. Extended technical support for Windows XP will also end in April 2014, which means no more patches, bug fixes, or other updates. Microsoft has revealed no release date for Office 2013, but let’s assume it debuts by the end of the year or early 2013. Why support an operating system that’s due to expire the following year, especially when you’re trying to push users to upgrade? Still, it’s a gamble. The number of XP installations will certainly continue to fall as more companies make the move to Windows 7. By even by the time Office 2013 launches, XP will still hold a healthy chunk of the market, leaving a lot of people unable to run the new suite. Windows and Office are Microsoft’s two bread-and-butter products, accounting for a major chunk of the company’s business. To continue to generate revenue, the company needs its customers to constantly migrate to the latest versions of both products. And while individual users can easily upgrade a single machine, businesses face the time, expense, and effort of migrating hundreds, thousands, or tens of thousands of machines. So despite Microsoft’s best efforts, many companies will continue to hold on as long as they can with their current versions of Windows and Office. You can also set up a drive in AutoPlay by connecting the drive to your PC, tapping or clicking the notification that appears and then tapping or clicking Configure this drive for backup. Lid closed – When a PC goes into sleep mode, File History detects the power mode transition and suspends its operation. Smartphones running Google’s Android software have been hijacked by an illegal botnet, according to a Microsoft researcher. Botnets are large illegal networks of infected machines – usually desktop or laptop computers – typically used to send out masses of spam email. Researcher Terry Zink said there was evidence of spam being sent from Yahoo mail servers by Android devices. Microsoft’s own platform, Windows Phone, is a key competitor to Android. The Google platform has suffered from several high-profile issues with malware affected apps in recent months. The official store – Google Play – has had issues with fake apps, often pirated free versions of popular paid products like Angry Birds Space or Fruit Ninja. This latest discovery has been seen as a change of direction for attackers. “We’ve all heard the rumours,” Mr Zink wrote in a blog post. “But this is the first time I have seen it – a spammer has control of a botnet that lives on Android devices. He said analysis of the IP addresses used to send the email revealed the spam had originated from Android devices being used in Chile, Indonesia, Lebanon, Oman, Philippines, Russia, Saudi Arabia, Thailand, Ukraine, and Venezuela. As is typical, the spam email looks to tempt people into buying products like prescription drugs. This was the first time smartphones had been exploited in this way, he said. “We’ve seen it done experimentally to prove that it’s possible by researchers, but not done by the bad guys,” he told the BBC. “We are seeing a lot of activity from cybercriminals on the Android platform. “The best thing you can do right now is upgrade your operating system, if that’s possible. Google told the BBC it did not respond to queries about specific apps but was working to improve security on the Android platform. “We are committed to providing a secure experience for consumers in Google Play, and in fact our data shows between the first and second halves of 2011, we saw a 40% decrease in the number of potentially malicious downloads from Google Play,” a spokesman said. RedHat, the makers of the popular Fedora Linux distro, made an announcement recently about the future of the OS that has some open source purists up in arms. Fedora 18 is expected to drop about the same time as Windows 8, and that means new hardware is going to be coming equipped with UEFI secure boot enabled. To ensure Fedora works smoothly for users, RedHat is getting cozy with the man. UEFI secure boot is essentially a method of locking a computer’s bootloader to make sure unsigned code, like pre-boot malware, cannot be run on the system. Microsoft originally wanted Windows-certified hardware to have secure boot turned on with no option to disable. Eventually, heavy pressure forced a change in that policy. While secure boot will be on by default, there will be an option hidden in the IEFI settings to disable it. In the interests of saving you some hassle, RedHat will be building a Microsoft-signed bootloader. Pick your jaw up off the floor and listen, because it’s not that bad. RedHat has decided to build a simple bootlaoder that will be certified by the Microsoft sysdev portal. This bootloader will really just be an intermediate that loads the real bootloader, which continues to be grub2. The sysdev portal charges an access fee, but it’s just $99. RedHat can certainly afford this small expense, and the cash ultimately goes to Verisign, not Microsoft. As the RedHat folks point out, this is the best option. Almost all hardware will be Windows certified, so it will have the Windows boot keys. RedHat would otherwise have to create its own keys, then work with hardware vendors to implement them to avoid getting in bed with Microsoft. The logistics make that impossible. UEFI secure boot operates on the idea that software which can directly interact with the hardware should be trusted. That’s not a terrible idea in and of itself, and we will have the option to turn it off on x86 systems. ARM devices running Windows will be locked to secure boot, though. For that reason, RedHat has no plans to support ARM tablets. None of this is final, but RedHat seems comfortable with the decision. It’s probably the most rational course of action. Windows 8 has a problem – it really can boot up too quickly. So quickly, in fact, that there is no longer time for anything to interrupt boot. When you turn on a Windows 8 PC, there’s no longer long enough to detect keystrokes like F2 or F8, much less time to read a message such as “Press F2 for Setup.” For the first time in decades, you will no longer be able to interrupt boot and tell your PC to do anything different than what it was already expecting to do. Fast booting is something we definitely want to preserve. Certainly no one would imagine intentionally slowing down boot to allow these functions to work as they did in the past. In this blog I’ll walk through how we’re addressing this “problem” with new solutions that will keep your PC booting as quickly as possible, while still letting you do all the things you expect. It’s worth taking a moment to watch (again, if you’ve already seen it) the fast boot video posted by Gabe Aul in his previous post about delivering fast boot times in Windows 8. In this video you can see a laptop with a solid state drive (SSD) fully booting in less than 7 seconds. Booting this fast doesn’t require special hardware, but it is a feature of new PCs. You’ll still see much improved boot times in existing hardware, but in many PCs, the BIOS itself (the BIOS logo and set of messages you see as you boot up) does take significant time. An SSD contributes to the fast boot time as well, as you can imagine. If the entire length of boot passes in just seven seconds, the individual portions that comprise the boot sequence go by almost too quickly to notice (much less, interrupt). Most of the decisions about what will happen in boot are over in the first 2-3 seconds – after that, booting is just about getting to Windows as quickly as possible. These 2-3 seconds include the time allowed for firmware initialization and POST (< 2 seconds), and the time allowed for the Windows boot manager to detect an alternate boot path (< 200 milliseconds on some systems). These times will continue to shrink, and even now they no longer allow enough time to interrupt boot as you could in the past. On the Windows team, we felt the impact of this change first, and perhaps most painfully, with our own F8 behavior. In previous versions of Windows (as far back as Windows 95), you could press F8 at the beginning of boot to access an advanced boot options menu. This is where you’d find useful options such as Safe Mode and “Disable driver signing.” I personally remember using them when I upgraded my first PC from Windows 3.1 to Windows 95. F8 helped me quickly resolve an upgrade issue and get started using Windows 95. The problem we saw with our F8 key extends to any other key you may want to press during boot. For example, in the Windows 8 Developer Preview release, the F8 key led to a full set of repair, recovery, and advanced boot options. A different key allowed developer-focused options, such as enabling debugging or disabling driver signing. And on most PCs, there are additional keystrokes used by the firmware and advertised by messages during POST: “Press F2 for Setup” or “Press F12 for Network Boot.” Now, POST is almost over by the time these instructions could be displayed. And in many cases, the keyboard wouldn’t be functional until so late in POST that it’s almost not worth the time it would take the firmware to look for these keystrokes. Some devices won’t even try. Even so, every one of these keystrokes plays an important role, and we have historically counted on them to provide important interrupt functions in boot. However, now, there is no longer time to do any of them. We looked at these problems from many angles, and took a holistic approach to solving them. This effort spanned across developers, testers, and program managers, examining everything from the deepest parts of the kernel to the overall user experience. Approaching this first as an engineering problem, we identified the situations and scenarios that depended on keystrokes in boot and considered literally dozens of ways to restore functionality to each scenario in Windows 8. Even when Windows is booting up correctly, you may want to do something different – for example, you may want to boot from an alternate device such as a USB drive, go to the firmware’s BIOS setup options, or run tools from within the protected Windows Recovery Environment image on a separate partition. In general, these scenarios were accomplished in the past mainly without the involvement of Windows, using firmware-specific keys such as F2 or F12 (or some other key that you couldn’t quite remember!). You may need to troubleshoot a problem after something goes wrong, or want to undo something that just happened. Windows has many tools that assist with situations like these, such as allowing you to refresh or reset your PC, go back to a restore point using System Restore, or perform manual troubleshooting via the always-popular Command Prompt. In the past, these troubleshooting options were accessed primarily via the Windows boot manager, by pressing F8 at the beginning of boot. Some error cases in startup are difficult to automatically detect. For example, the Windows boot process may have succeeded, but errors in components that are loaded later actually make Windows unusable. These cases are rare, but an example of where this might happen is a corrupt driver installation causing the login screen to crash whenever it loads. On previous-era hardware, you could interrupt boot with a keystroke (F8, for example) and reach a suitable repair option before the crashing component was even loaded. Over time, it has gotten harder to interrupt boot in this way, and in Windows 8, it’s virtually impossible. We needed to enable certain startup options that are mainly used by developers – both inside and outside of Windows. Previously you could access these by pressing a key like F8 at the beginning of boot. These developer-targeted options are still important and include disabling driver signature enforcement, turning off “early launch anti-malware,” as well as other options. We pulled together all the options into a single menu – the boot options menu – that has all the troubleshooting tools, the developer-focused options for Windows startup, methods for accessing the firmware’s BIOS setup, and a straightforward method for booting to alternate devices such as USB drives. We created failover behaviors that automatically bring up the boot options menu (in a highly robust and validated environment) whenever there is a problem that would keep the PC from booting successfully into Windows. Finally, we created several straightforward methods to easily reach the boot options menu, even when nothing is wrong with Windows or boot. Instead of these menus and options being “interrupt-driven,” they are triggered in an intentional way that is much easier to accomplish successfully. Each of these solutions addresses a different aspect of the core problem, and together they create a single, cohesive end-to-end experience. A quick note about older, non-UEFI devices: legacy hardware that was made before Windows 8 will not have these new UEFI-provided menu features (booting to firmware settings and booting directly to a device). The firmware on these devices will continue to support this functionality from the POST screen as it did in the past (using messages such as “Press F2 for Setup”). There is still time for keystrokes like this to work in POST on these legacy devices, since they won’t have the improvements that enable a Windows 8 PC to POST in less than 2 seconds. Aiming to give parents the option of keeping an eagle eye over their kid’s computer use, Microsoft revamps its parental controls in a “monitor first” approach that includes weekly reports. Microsoft aims to give parents more control over their children’s computer use on Windows 8 with a new feature announced this week. With these controls and weekly reports, parents will be able to keep tabs on whether their kids are playing violent online video games, looking at bikini models, or actually doing their homework. They’ll also be able to make sure their children aren’t associating with online predators. Most previous parental controls focused on complex filtering options or using software to block children from Web sites; however Microsoft says with Windows 8, it’s now taking a “monitor first” approach. The company says this new system is much easier. How it works: parents sign into Windows 8 with a Microsoft account, create a separate user account for each child, and then check the box to turn on Family Safety. From there, parents can make the controls more or less restrictive and see what their kids are doing via the weekly e-mail reports.